After ordering her salad, Pree Walia reaches into her wallet to pull out a credit card. She hands it over to the cashier, who grabs the card and stops. “I love your nails!” the cashier says, excitedly. She grabs Walia’s hand and looks at her fingernails, with a different emoji on each one. It’s a charming and effective opener. After all, nails, to some extent, are Walia’s business. After a career working on political campaigns, Walia jumped headlong into the startup world, working at an LED lighting company, where she finally had her own lightbulb moment about body-safe ink. 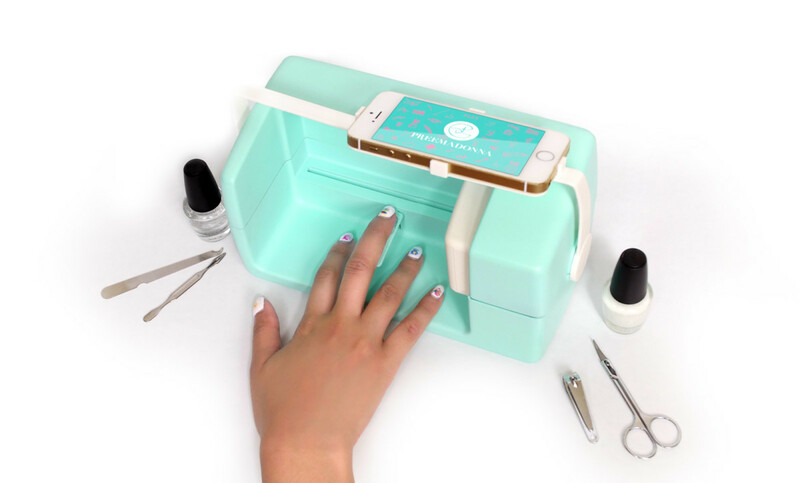 The result is Preemadonna, a beauty tech hardware startup currently crowd-funding the Nailbot: a piece of hardware designed to safely print nail art designs with real ink and a smartphone. On its face, the Nailbot looks like an unlikely candidate for Silicon Valley success, as its directed towards a generally underserved market — tween and teen girls. But that assumption belies Walia’s own relentless pursuit of visibility in an ecosystem flooded by products generally made by and at least predominately made for men. It also doesn’t speak to the startup’s current success: in addition to developing a working and focus-tested hardware product, the company wowed enough judges to make the finals at this year’s TechCrunch Disrupt. The iteration of the Nailbot that Walia and her co-founder — robotics engineer Casey Kute Schulz — brought to Kickstarter is their motorized version, which retails for $199. Girls (and women) affix a smartphone running the Nailbot app and connect to the printer via Bluetooth. After painting a (preferably white) coat of polish on the nails, the Nailbot app takes a picture of the nail in order to size the selected art correctly and then prints the icon directly onto the nail. Developed after continuous testing in both mechanical and non-mechanical prototypes, Walia is excited about how far the hardware startup has come in creating proprietary technology that makes this difficult task look effortless. Namely, since spending four months in Shenzhen, China, where she and Schulz worked on the device as part of the Hax accelerator program. “We had short-listed our contract manufacturers, gotten our prototypes in a better state for manufacturing, and developed the technology to ship on time at a price point we could stand by,” she said. For all their work, the Nailbot sounds cute. But cute is a hard sell in Silicon Valley: in 2015, less than one third of American venture capital firms have at least one female partner, and of the 100 largest VC firms in the country, 40 of them are male-only shops. Walia said that she’s had a hard time convincing male venture capitalists that nail art hardware is worthwhile, with many probing her with questions regarding the demand for nail care among girls and women. For a common question — “How much of an issue is painting a nail with a non-dominant hand?” — Walia came up with a creative solution. The knowledge gap surrounding beauty, and the ways that the tech startup industry can solve them beyond monthly subscription ecommerce services, often means that endeavors like Walia’s look faddish. But colloquially, Preemadonna is targeting one of the most powerful, unseen influencers on the Internet: teen girls. While they are purposefully kept out of user demographics due to their age, there is plenty of evidence that teen girls have a particularly effective sway in not only the sustained popularity of a platform (see: Twitter, Instagram, Snapchat, YouTube) but also the elevation of hardware to a prestige device (see: the iPhone). Walia is just as passionate about that demographic. And those involved in backing Preemadonna have embraced Walia’s vision. In perhaps no surprise, Walia confirms that she has a very healthy base of female investors — mostly small donors who really care about what Walia wants to achieve with Preemadonna. And despite having a beauty-focused approach, Walia sees the Nailbot as more than just a product, and Preemadonna as more than just a beauty company. She has developed partnerships with organizations like Girl Scouts of New Mexico Trails and Maker Girl to help introduce coding concepts to girls at an early age. In one particular perk in the campaign, the company is offering a full program to help girls create their own touchscreen printer. Developed with curricula by Schulz, Walia says the company is keen on creating products that inspire girls to understand their own capabilities. So yes, Walia, Schulz and Preemadonna are in the business of nails. But they’re also in the business of empowerment for young women, and that is not a novelty.